For fun, I developed my own rating system for NBA players using box score statistics. This one-number performance rating takes into account traditional counting stats and balances them with shooting efficiency, and plus/minus in a novel way. This rating system is at least as flawed, if not more flawed, than any other rating system ever created. But it was a fun project and I hope to continue tracking players year by year just to see what kind of numbers result over time. It is not meant to determine how good a player is. It is aimed at answering the question: how good of a game or season did the player have? Since the best players will tend to have the best seasons, they will tend to be ranked higher in the J Rankings. Because this rating takes into account and rewards cumulative stats as well as team success, while making no claims in regard to “best player”, it might be a good number to look at in consideration of the MVP award. For each game a player appears in, they receive a J Rating number for that game. These numbers can be averaged to achieve their J Rating on the season. They can also be summed to create their total J Points on the year (though I’m not sure this is meaningful). I'm curious what kind of math is behind the numbers. Want to see the math. Yes, we like math. Please show, such that we can copy this rating system from you and sell it . Like any rating system based on box score statistics your system probably doesn't take defense (enough) into account. And does passing accuracy and rebound rate play a role in J-rating? Without the formula this is completely useless. Edit it in so we can actually discuss your rating system. Obviously without knowing the formula and what is accounted for and how, it makes it more difficult to offer critique, however, looking at the rankings they appear to about what you would expect if you were putting something like this together. 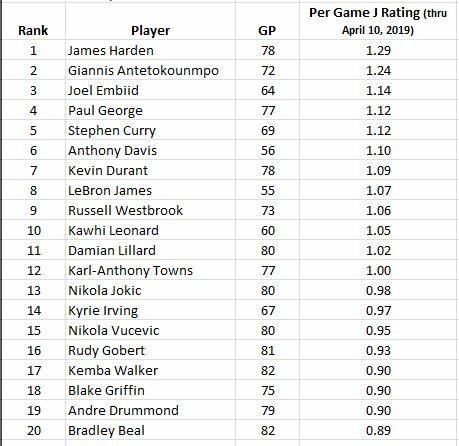 Harden and Giannis at 1 and 2 and a good deal better than the next group, who have Embiid, George, Curry, Davis, and Durant all pretty closely grouped, followed by Lebron, Westbrook, and Kawhi. I mean looking at the stats for the season, that seems about right. I'd definitely be interested to see how much games played alters things. Is that you, Bernie (Madoff)? I'm also interested in the methodology. Sounds interesting, but I need a hint on how these numbers are formulated. 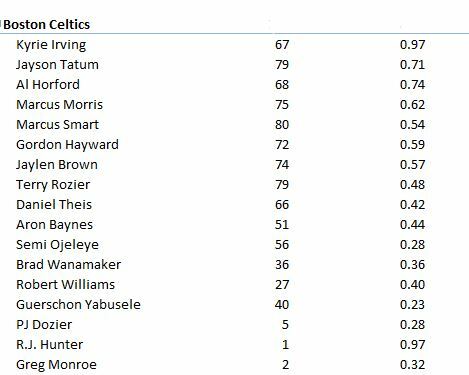 Interested to see Baynes ranked so low. He's clearly critical to the team's success. The rating is just an average of each game's rating. So games played doesn't affect the rating. You'd have to take into consideration separately the value of a 1.07 over 55 games (Lebron) vs. a 1.06 over 73 games (Westbrook). 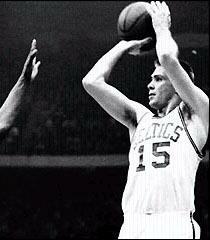 I think a knock on Baynes in terms of his rating here is his only 16.1 minutes per game average. Limits his impact somewhat. So everything being equal, the more minutes you play per game the higher your J Rating? What is the correlation? I won't give away the exact formula because my methodology is somewhat outdated (I devised drafts of it maybe 15 years ago, but took me years to get to a point where I could access the data I needed in an efficient way). Also, part of my interest in actually playing this out is judging my ratings vs. general perceptions of nba players' performances. However, I'm getting everything from traditional box scores and weighing TS% and +/-. I know how flawed this can be, but that's why I say this rating does not tell you how good a player is, but how good their performance was. I'm working on a new rating system, but I think I'm going to compile seasons 2001-present first to help me see particular areas for improvement.